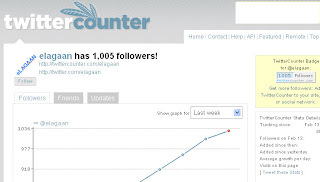 Thanks to all the supporters, @eLagaan reached a 1000 Followers today. We appreciate all the love and messages that we get from you. So go on follow us and keep sending those messages using twitter http://twitter.com/elagaan . New to twitter? Here is a little something about twitter. And as always use our Tax Forums to ask any income tax questions that you may have.